SCRANTON, William Warren, (grandnephew of Joseph Augustine Scranton, great–grandson of Worthington C. Smith, great–great grandson of John Smith), a Representative from Pennsylvania; born in Madison, New Haven County, Conn., July 19, 1917; attended the Hotchkiss school; B.A., Yale University, New Haven, Conn., 1939; LL.B., Yale Law School, New Haven, Conn., 1946; United States Army Air Corps, pilot with overseas service in Africa, the Middle East, and South America, 1941-1945; associated with the International Textbook Co., and Haddon Craftsman, Inc., 1947-1952, rising to position of vice president; president of the Scranton-Lackawanna Trust Co., 1954-1956; chairman of the board of Northeastern Pennsylvania Broadcasting, Inc., 1953-1959; special assistant to Secretary of State Christian A. Herter, 1959 and 1960; elected as a Republican to the Eighty-seventh Congress (January 3, 1961-January 3, 1963); was not a candidate for renomination in 1962, but was a successful candidate for Governor of Pennsylvania; Governor of Pennsylvania, 1963-1967; candidate for Republican presidential nomination in 1964; delegate and chairman of Judiciary Committee, Pennsylvania Constitutional Convention, 1967-1968; vice chairman, President's Commission on insurance for Riot-torn Areas, 1967; United States Ambassador, 1969; member, President's Advisory Committee on Arms Limitation and Disarmament; Representative of the United States to the United Nations, March 15, 1976, to January 19, 1977; died on August 28, 2013, in Montecito, Calif.
Papers: 1952-1978, 150 linear feet. The papers of William Warren Scranton include correspondence, reports, tape recordings, and typescripts of speeches, press releases, drafts and final copies of publications, photographs, movie film, newspaper clippings, and scrapbooks. 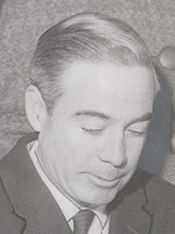 Most of these materials concern William Scranton's duties as an officeholder, public servant, and national political advisor during the 1960s and 1970s. The major groups of documents for this part of William Scranton's career are files from his congressional and gubernatorial offices, correspondence on his campaign to win the Republican Party presidential nomination in 1964, and correspondence, position papers, reports, photographs, and meeting agenda and minutes from numerous governmental panels and task forces, including the U.S. Price Commission (1971-74), President's Commission on Campus Unrest (1970-71), the Carnegie Commission on Higher Education (1969-74), U.S. Railway Association (1974-76), ConRail (1974-76). There are also correspondence, memos, and telegrams covering William Scranton's diplomatic assignments in Europe and the MidEast (1968) as a special envoy and at the United Nations as U.S. Ambassador (1967-77). There are additional large groups of papers concerning William Scranton's business interests and his activities on behalf of Yale University. Smaller groups of papers touch on William Scranton's involvement with civic and non-profit organizations, including colleges and universities, hospitals, environmental groups, and lobbying organizations. An unpublished finding aid is available in the repository. Papers: 1 letter (December 1, 1976) in the Bella Abzug collection. Finding aid in repository. Papers: 1 letter (April 19, 1961) in the W.W. Norton collection. Personal business. Finding aid in repository. Sound Tape Reel: In the Henry Brandon Collection Audio Materials, 1965, 1 sound tape reel. An interview of William Warren Scranton by Henry Brandon, 1965. Papers: 1963-1967. 666 feet. Gubernatorial correspondence and papers. Unpublished finding aid in repository. Restricted. Sound Tape Reel: 1964, 1 sound tape reel. An interview used during William Warren Scranton's campaign for the 1964 presidential election, Republican Party. Papers: In the Pennsylvania Governor (1963-1967: Scranton) Correspondence with Marian Anderson, 1963-1966, 11 items. Alderfer, Harold Freed. William Warren Scranton, Pennsylvania Governor, 1963-1967. Mechanicsburg, Pa.: Local Government Service, 1976. Wolf, George D. William Warren Scranton: Pennsylvania Statesman. University Park: Pennsylvania State University Press, 1981.